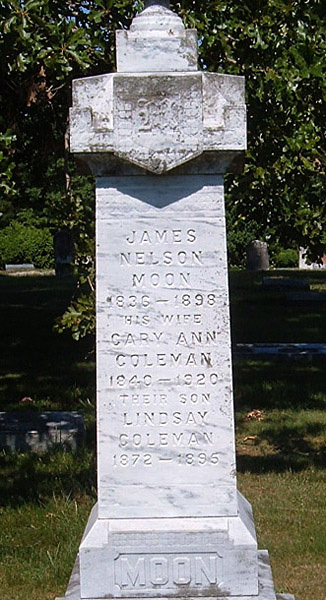 Comments: James Nelson Moon was born on 11 December 1836 at Mt. Ayr Farm, Albemarle County, Virginia. He was the son of John Digges Moon and Mary Elizabeth (Barclay) Moon. James attended preparatory school at Frank Minor's and graduated from the University of Virginia in Charlottesville. He was well versed in Latin, Greek, French, and German and worked as a teacher. After the outbreak of the Civil War, James Nelson Moon enlisted at Scottsville, Virginia, in Co. C, 19th Regiment Virginia Infantry, C.S.A, on 17 April 1861. He was mustered into service on 11 May 1861 in Charlottesville but was sent back home on furlough due to an illness. James was present for duty with his Co. C from September 1861 through January 1862 until he was again sent to the hospital on 3 February 1862. On 30 May 1862, James sent a substitute to Co. C in his place, and James was discharged on that date from Co. C.
When his health improved, James started in the real estate business in Atlanta, Georgia, and studied law in the interim. In 1863, James returned home to Scottsville and volunteered in Company D., 43rd Battalion, Virginia Cavalry, Mosby's command, for the remainder of the Civil War. After the War, James returned to Albemarle County where he married Cary Ann Coleman (b. May 1840, Virginia), daughter of John Harris Coleman and Sarah Nelson (Nicholas) Coleman. James and Cary Moon lived at Shirland in Albemarle County, Virginia, and were the parents of the following children: Orie Lewis Moon, Mary Barclay Moon, Lindsay Coleman Moon, Frank Russell Moon, Frances Nicholas Moon, Cary Nelson Moon, and Anna Moylin Moon. James died on 20 September 1898 and his wife, Cary, passed away on 27 December 1920; James and Cary are buried in Scottsville Cemetery in Scottsville, Virginia. 1) 19th Virginia Infantry by Ervin L. Jordan, Jr., and Herbert A. Thomas, Jr. (Lynchburg, VA: H.E. Howard, Inc., 1987), p. 86. 2) 43rd Battalion, Virginia Cavalry, Mosby's Command by Hugh C. Keen and Horace Mewborn (Lynchburg, VA: H.E. Howard,Inc., 1993), p. 350. 3) Sketches of the Moon and Barclay Families compiled by Anna Mary Moon, c. 1939, p. 25. 4) The Steeles of Steeles Tavern, Virginia and Related Families, p. 70. 6) "Compiled Service Records of Confederate Soldiers Who Served in Organizations from the State of Virginia." Source: The National Archives Publication No. M324; NARA Catalog ID 586957; Microfilm Roll No. 0625; Compiled 1903-1927, documenting the period 1861-1865.